In 1919, as Irish rebels combated the British army and Unionists, William Butler Yeats wrote one of his most famous poems, “The Second Coming.” The poem has drawn new readers since the financial collapse of 2008, as a spare, lucid evocation of the spirit of the times. More prosaically, the three contributors to this section analyze “things fall apart” a century later. Eric Shaw dissects the complex divisions within the British Labour Party occasioned by the issue of immigration. When Labour was in office before 2010, it was generous in admitting immigrants from new European Union member states in Eastern Europe – the iconic “Polish plumbers.” Now, anti-immigrant sentiment has become strongly entrenched, particularly among low-income working-class voters who traditionally voted Labour but now disproportionately support the anti-immigrant United Kingdom Independence Party. Shaw summarizes the rifts within Labour among the holders, who want to maintain a pro-immigration stance, defuse advocates who pessimistically believe the most Labour can do is to ignore the subject and adopters who believe the economic costs from immigrants to low-income Britons de souche and cultural conflicts are so profound that Labour must adopt a much more restrictive set of immigration policies. Pending Britain’s June 23 referendum on its EU membership, Jan Eichhorn surveys respondents in six EU member states on attitudes to a possible British exit. The majority want Britain to stay; not surprisingly, the least enthusiastic are the French. The unexpected result from his survey, at least for me, does not concern attitudes to Brexit but the extent of the desire among respondents in the six countries (France, Germany, Spain, Sweden, Poland and Ireland) to conduct their own national EU-exit referendums. A plurality in Sweden, Spain and Germany favour holding such a referendum; in France, an overall majority are in favour. 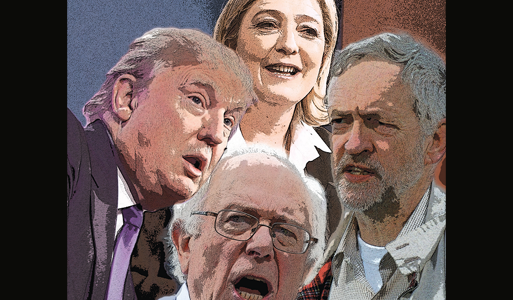 Patrick Webber offers a grand tour d’horizon of populist parties from Syriza in Greece to the Donald Trump / Bernie Sanders presidential campaigns in the United States. He seeks to explain why the legitimacy of centre-left and centre-right parties is crumbling and identifies the similarities among the populists regardless whether they define themselves as left or right.